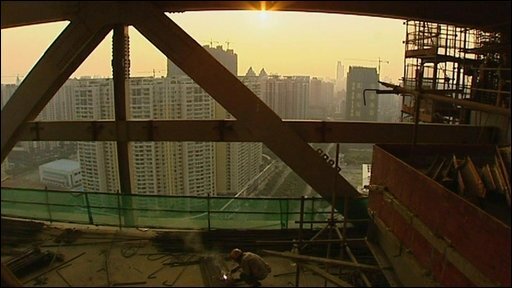 BBC environment analyst Roger Harrabin reports on the tower block under construction in China which could lead the way in green building technology. They are by no means the only architects to espouse the principle of integrated design, of course. But some observers believe that too many buildings are still being put up with a few bolt-on green features, without proper thought as to what could be achieved through a more considered approach. Take the cooling system in the tower. Most of the time, air conditioning is done by fat air ducts which gobble both energy and space between floors and ceilings. Here the cooling is done by a cool water system. The water flows in ducts through concrete beams, and cool air descends upon the toiling masses from cold water radiators in the ceilings. This doesn't just save energy. SOM say it saves so much space that it's allowed the building's owners to put in an extra five storeys of usable office floor at little extra cost. Indeed, they predict that the extra investments in the building will start making the money in five years. There are other green features too. There's a wide-spaced double-glazed wall, which channels hot air upwards to a mechanical floor where it's harnessed for dehumidification. There's also substantial use of solar photovoltaic technology on the frontages of the building, which curve upwards toward the sun, although the current cost of photovoltaic arrays militated against cladding the building completely in energy-generating glass. Inside there are numerous automatic control systems to make sure power isn't being wasted. SOM say they could have coaxed the building to produce more energy but it would have been futile because there's no facility in Guangzhou to feed self-generated power back into the grid. To many, this will be a familiar tale. I can't verify whether all its claims are true, but the building is undoubtedly an exciting project. 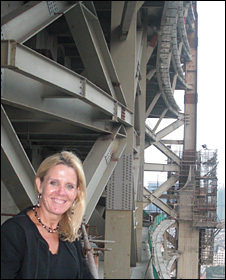 Ame Englehart, director of SOM's East Asia office said: "This building is so radical it could only have been commissioned in China. The owners are very self-confident and have been prepared to push the design as far as it will go." SOM insists that the design is site-specific and can't just be replicated elsewhere. But the sad observation from my viewpoint standing on the girders of the 24th floor is that this tower is very much the exception rather than the rule. The Chinese government has increased building standards recently but they still don't lead to anything like the performance of the Pearl River Tower. A report in the China Daily during my trip suggested that 40% of bribery cases in China involve property development. And a Western businesswoman I bumped into told me her firm couldn't persuade Chinese clients to invest in more energy-efficient vehicles even if she could prove that they would start paying back their owners in energy costs in just 10 months.